It is with the greatest satisfaction I have the honor to state to you, that the Treasury Department has authorized me to direct a representative of the United States Coast Survey to attend the meeting of the International Geodesical Association, over whose deliberations you so ably preside. It has been our good fortune to have had on previous occasions, officers of our organization in the vicinity of the meetings of the Association, to whom the Association, through your good offices, has cordially extended invitations to be present at and take part in their discussions, although not specially and officially accredited. These experiences have been of great advantage to these officers, as well as to our work. 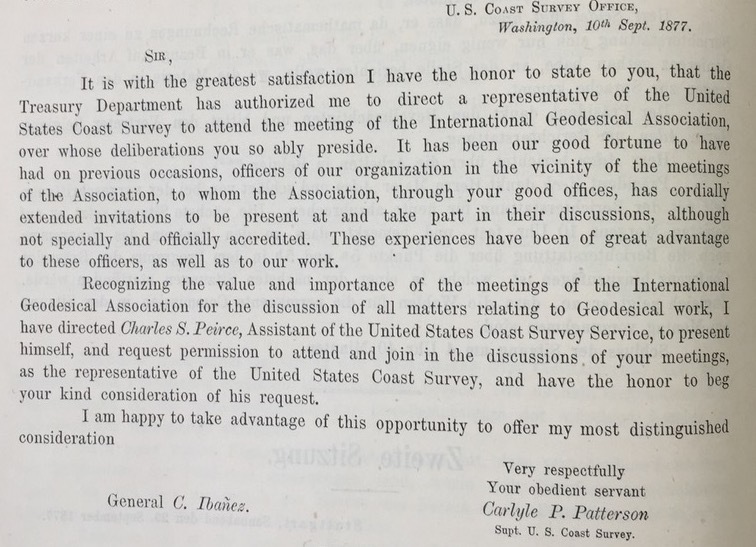 Recognizing the value and importance of the meetings of the International Geodesical Association for the discussion of all matters relating to Geodesical work, I have directed Charles S. Peirce, Assistant of the United States Coast Survey Service, to present himself, and request permission to attend and join in the discussions of your meetings, as the representative of the United States Coast Survey, and have the honor to beg your kind consideration of his request. I am happy to take advantage of this opportunity to offer my most distinguished consideration.